WASHINGTON, D.C. -- As the U.S. Senate begins considering legislation that could significantly change the nation's healthcare system, the cost of healthcare leads the list of what Americans consider the most important financial problem facing their family. 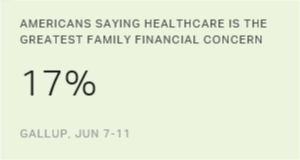 The 17% who name healthcare costs as their family's most pressing financial problem is up seven percentage points since 2013 and is just two points shy of the all-time high of 19% recorded in 2007. These results come from a June 7-11 Gallup poll. Americans' concerns about the cost of healthcare fell substantially in 2008 amid the financial recession. These concerns were replaced with more fundamental financial problems such as a lack of money, low wages and unemployment. Higher gas prices also weighed heavily on American families' finances at that time. As the political debate over the Affordable Care Act (ACA) heated up in late 2009 and 2010, healthcare costs once again became one of the most commonly cited top financial problems, reaching as high as 15% in April 2010, shortly after the bill was signed into law (though the figure fell to 10% later that year). Over the next few years, concern about healthcare typically stayed around the 12% to 14% range, though in 2013, concerns dropped down to 10% as more provisions of the legislation were implemented. 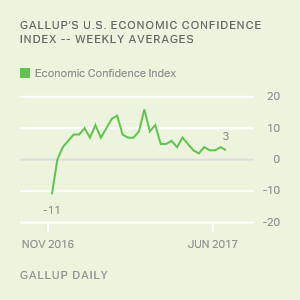 However, concerns again inched up in 2014 and continued moving up in subsequent years, culminating with this year's 17%, the highest level since October 2007. Rising concern about healthcare costs comes at a time when Congress is working to develop a legislative plan to repeal major parts of the ACA, if not the entire legislation. Uncertainty surrounding the new healthcare bill and how it would affect costs may be one reason that more Americans cite healthcare as a top financial problem. Besides healthcare costs, other prominent financial problems Americans name as the most important facing their family this year include high debt (11%), lack of money (10%) and college expenses (10%). In some instances, these financial anxieties have lessened in recent years. Notably, the 10% of Americans who say low wages are their family's biggest problem this year is the lowest since before the financial crisis. Likewise, concerns about the high cost of living or inflation have fallen to 8% this year from 13% in 2011 -- likely the result of falling fuel prices. But other concerns are showing no signs of retreat. Eleven percent of Americans named too much debt as their family's most important financial problem, on par with readings in the post-recession period. Concern about college expenses -- a problem that has received growing attention in recent years -- was steady this year at 10%. Other financial problems Americans mention include the cost of owning or renting a home (9%), the high cost of living (8%), retirement savings (6%), taxes (5%), unemployment or loss of a job (3%), Social Security (3%) and lack of savings (2%). The cost of healthcare is now the top financial problem facing U.S. families. Concern about healthcare costs is at nearly the same level now as it was in 2007, a time before the recession and the passage of the ACA. Republicans in Congress, as well as President Donald Trump, may argue that rising concern about healthcare costs is yet another reason why the ACA should be repealed. And there are signs that the law is under severe stress and costs may be rising for some Americans, as some health insurance companies pull out of the individual exchange markets. However, it is possible that news about the potential repeal of the ACA may itself be causing concern about healthcare costs to spike, as was the case in 2010, when Congress passed the bill after a long debate.